Robert Uzzell: I can’t tell you the comments I’ve read on Twitter, Facebook, and other boxing webpages crucifying Saul “Canelo” Alvarez. 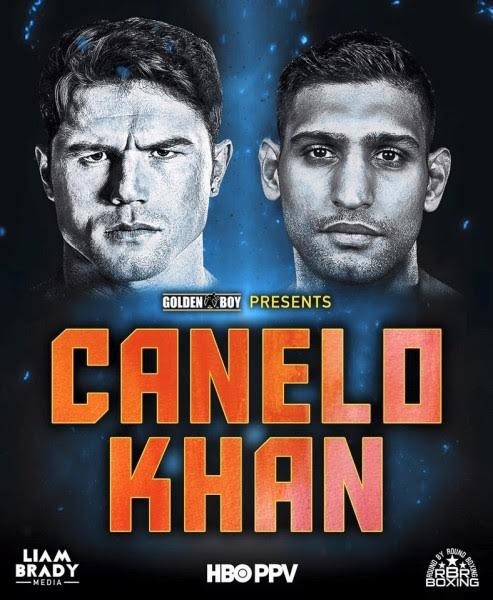 A catchweight, lineal middleweight title fight (155 pounds) has Canelo stepping into the ring to defend against Amir “King” Khan. Fans are furious at Alvarez (46-1-1, 32 KOs) for “cherry-picking” a much smaller Amir Khan (31-3, 19 KOs) who has only fought at welterweight twice. They say this is a complete mismatch and an easy win for Canelo. ‘NOT SO FAST MY FRIEND!’ (in my Lee Corso voice). I like this fight from both fighters’ angles. Listen fans, you have to be more optimistic. Put yourself in Canelo’s shoes. He has a potential showdown looming with Gennady “GGG” Golovkin later this year. This one is simple and plain: Canelo needs an opponent to justify this as a pay-per view fight and to build his brand. Not only that, Canelo needed an opponent to bring in numbers and Khan has the following to do so. There’s nobody else out there that fits the criteria as well as Amir. From Khan’s angle, this is a big payday on behalf the fighter who is probably the new cash cow of boxing. The stage is set for Amir to have a career-defining moment and not be in the shadow of anyone else. If he loses, it’s okay because most already suspect he is headed that way. If he wins, the world is his. Then potential showdowns with the men he’s been chasing (insert two names here) will be more naturally made, as fans will demand it. I give Khan a shot in this fight. Here’s why: Saul Alvarez still has feet lodged in cement when he fights. Look at the fighters that gave him the most trouble. They had good footwork, fast hands, or both. Austin Trout gave movement and angles. He had Canelo in trouble at one point, but didn’t follow up. Many thought Trout won the fight. Floyd Mayweather Jr had the footwork and movement when at angles that gave Canelo fits. He won their fight. Erislandy Lara (track shoes included) moved so much in the fight that some called it running. Nevertheless, he landed cleanly throughout the fight. Many thought he won the fight. You can argue that in many ways, Canelo will find more success with Golovkin than he would with Khan. Golovkin isn’t going to use a lot of movement. He’s going to come forward and be in the pocket and will attempt to back Canelo up. Khan’s game plan will be to use his fast hands and movement to make Canelo work. He can jab to the body and head, give angles, and keep moving. That recipe is trouble for Canelo. It’s proven. In addition, when Canelo is forced to move, himself, he has to reset and start again. By that time, Khan will be gone from the pocket and set up again to beat Alvarez to the punch. I’m not going to give a prediction at this point, but I will say it’s ironic that the last name “Khan” rhymes with “Conn”. The most likely scenario for how this fight will play out will be similar to Joe Louis vs Billy Conn I.
Louis was World heavyweight champion and Conn wanted to become the first light heavyweight champion to win the heavyweight title. Conn used speed and movement (just as Khan should do on May 7) to befuddle Louis for 13 rounds. Conn had a lead on the scorecards heading into round 13. The fight was his to win. However, after staggering Louis in round 12, Conn decided to go for the knockout in the next round. Louis landed a jab and right hand that hurt Conn, and finished him with multiple body-head combinations. If I had to guess how it plays out on May 7, I think Khan will lead at times and counter during other moments in the fight. I think he can potentially build a lead as he did with Danny Garcia and Zab Judah. The key is can he keep Canelo off him for 12 rounds? I tell you one thing, if Khan goes into the ninth or tenth round with a solid lead, I don’t think he makes the mistake that Conn made against Louis… or the mistake Khan made against Garcia, if you catch my drift. I think Khan will jump out to an early lead and it’ll be up to Canelo to give chase in this cat and mouse affair. I think fans will be surprised that this fight will do a decent number at the box office. I believe the pay-per view numbers will be solid to negate all the naysayers who knock this fight. Lastly, I think this fight will be surprisingly entertaining, whether it’s an early KO, late KO, or a decision. You are here: Home / Boxing News / Canelo vs. Khan: A great fight!